Yorkshire Dales road cycling may seem like an obvious focus for an avid cyclist. But as long-time Ilkley rider Charles Oxtoby explains in the post below, it was not always the case, for him, or others. – Ed. I got hooked on cycling in the mid-1990’s. Mountain biking that is. I was drawn to the freedom it gave me to explore the wild Yorkshire Dales moors. Nothing could keep me out of the back country. Nothing, that is, until the outbreak of Foot and Mouth disease in 2001. Overnight, authorities banned all off-road cycling in the Dales. As hooked as I was on cycling, I just pointed my fat MTB tyres down the road and pedaled. On a whim, however, one day I borrowed a road bike from the local bike shop in Ilkley. Road cycling seemed like a doddle to me. Particularly compared with tackling the rugged and dangerous terrain up on the moors. I plotted a ride up the Wharfe Valley. On the way back, however, I turned to go up the notorious Langbar climb. I heard local road cyclists chatter endlessly about its challenges. It was not quite a doodle I had expected: halfway up the first steep section I felt my strength being sapped. I made it, finally, to the top, but came away with the realisation that there was something more to road cycling than just whizzing along on tiny tyres: this was pretty tough. I liked the challenge! From that day until this, I have hardly been on my mountain bike. 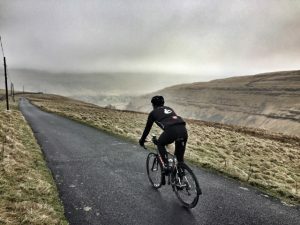 I was hooked on tarmac – Yorkshire Dales road cycling was for me! I started watching professional cycling on the telly, following Lance Armstrong’s string of now-tainted Tour de France victories. At the time, there were few British cyclists to follow at the elite level of the sport. In at least one of the Armstrong years, there were zero British riders in the Tour. How things have changed! It is something that I have witnessed firsthand with the blossoming of the sport in Yorkshire. Like many newcomers to road cycling, I stuck to fairly short rides. And I often took the same route, again and again. One year, however, a friend and I decided to enter a ‘sportive’ called the White Rose Classic. At the time, the event started and finished in Otley. This was before the Ilkley Cycling Club adopted it as its annual signature event. I chose the Medium Route. For me, it was an epic ride, not the least because it was a roasting hot summer’s day. After pushing myself to finish, I had to lie down in a cool, darkened room for an hour to regain my composure. On the route, however, I met loads of new people, cycled in a group for the first time, and explored some roads I never knew existed. 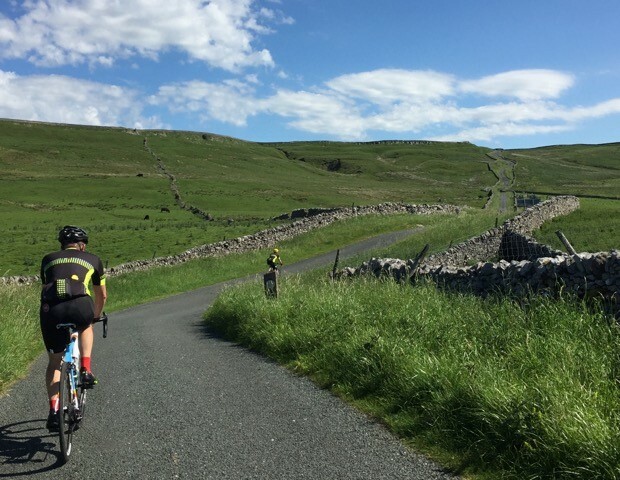 Since that first sportive, I have come to love exploring Yorkshire Dales road cycling. I now take others on adventures, including some of the classic climbs used in the White Rose Classic. One of my favourite roads is the Medium Route heading up Littondale and over Halton Gill. This quiet and untouched valley is a hidden gem. The view you experience to your left, with Pen-Y-Ghent to the right, is one of the best in the Yorkshire Dales. Simply breathtaking! As I became a more accomplished cyclist, I jumped at the chance to help reestablish the Ilkley Cycling Club in 2011. One of my proudest projects was helping to ‘rescue’ the White Rose Classic in 2012. It had been the premier Yorkshire Dales road cycling sportive. The original organisers had to cease operating the event. Long may this classic sportive continue, run entirely by the friendly faces of Ilkley CC! 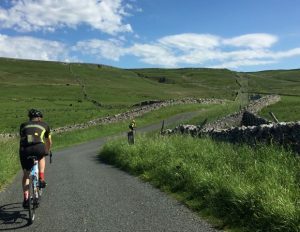 Charles Oxtoby, lives in Ilkley and runs Yorkshire Velo Tours, a company dedicated to helping others enjoy the roads and the scenery of the Wharfe Valley and the Yorkshire Dales road cycling that he knows so well. Not ready to register yet?